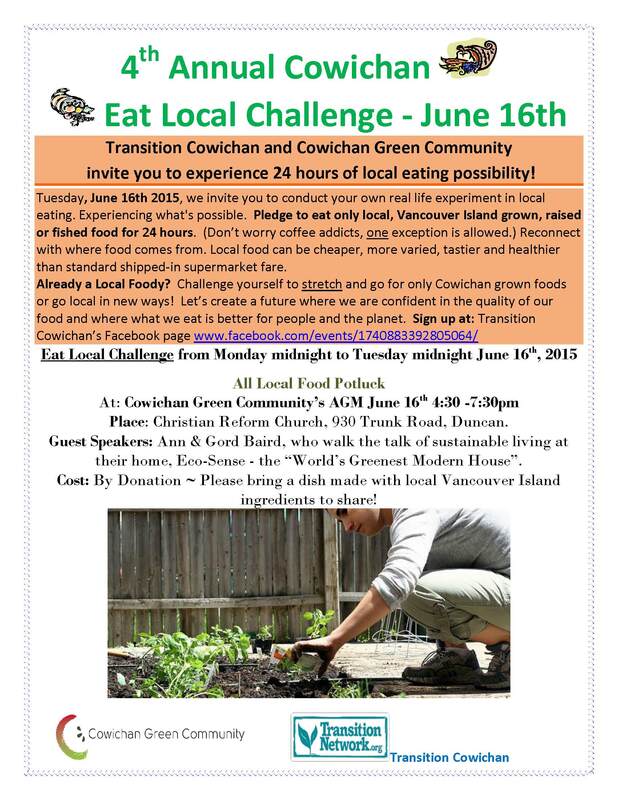 This coming Tuesday, June 16th, Transition Cowichan and Cowichan Green Community invite Cowichan residents to take up the challenge to eat only local, Vancouver Island grown, raised or locally fished food for 24 hours as part of the Valley’s 4th Annual Eat Local Challenge. You can sign up at: www.facebook.com/events/1740883392805064/ or at the CGC store. June is a great time to give eating local a try. We’ve got the Saturday Farmers’ Market in Duncan, and a number of smaller farmers’ markets mid-week, lots of farm gate sales, shops and restaurants that feature local fare, and many of our own back yards producing food. 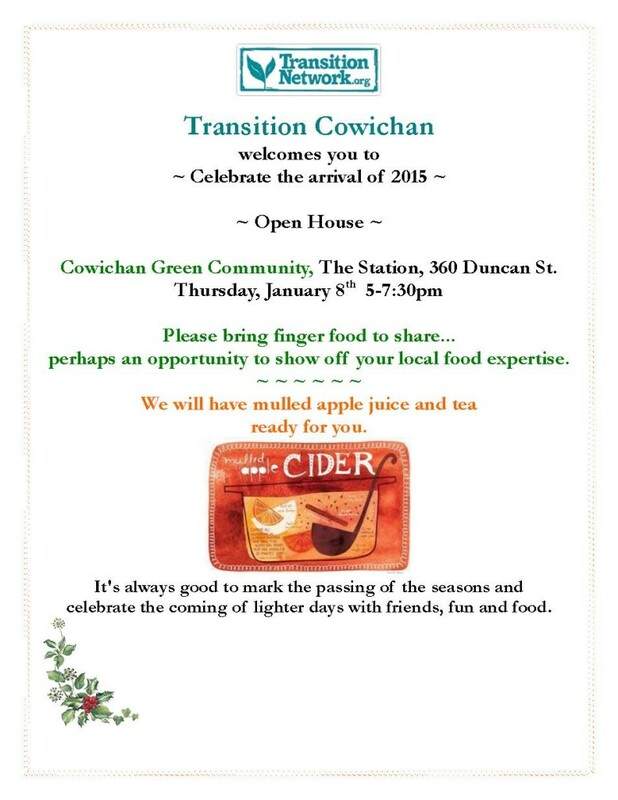 Transition Cowichan takes a leaf out of writer Barbara Kingsolver’s book Animal, Vegetable, Miracle, who describes her family’s journey to eating locally. As a part of the Challenge every family member is allowed to pick one small non-local item the family can eat for the day. Maybe you can’t imagine going 24 hours without a cup of coffee, so that can be your choice, and you can go for fair trade, locally roast beans. 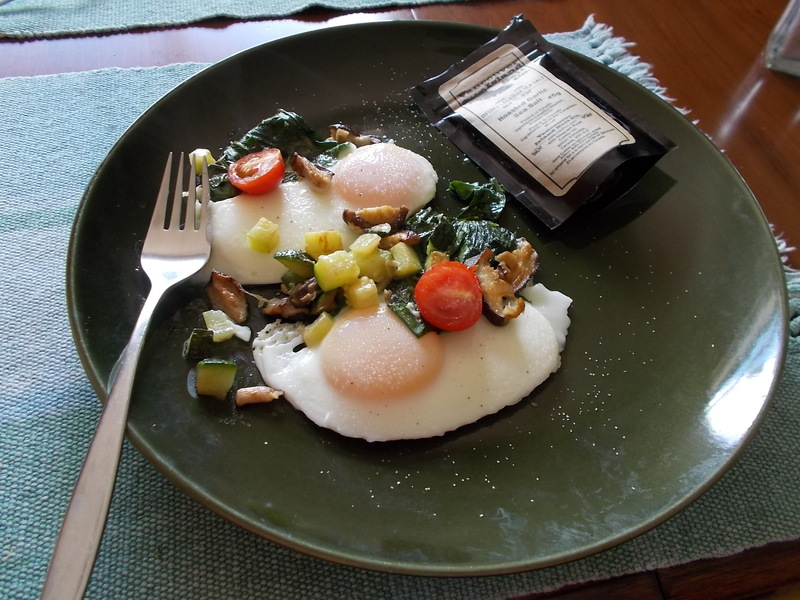 Perhaps you’ve got a favorite oil and vinegar dressing that you can made with local herbs and vinegar, but the olive oil comes from off island. But, if you’re thinking salt,there’s actually great Vancouver Island salt available locally (see packet in the photo). The idea is to experience the wide variety of tasty, healthy food that can be sourced locally without the carbon footprint associated with standard shipped-in supermarket fare, to support local producers, and imagine what we can all do to increase food security on Vancouver Island. 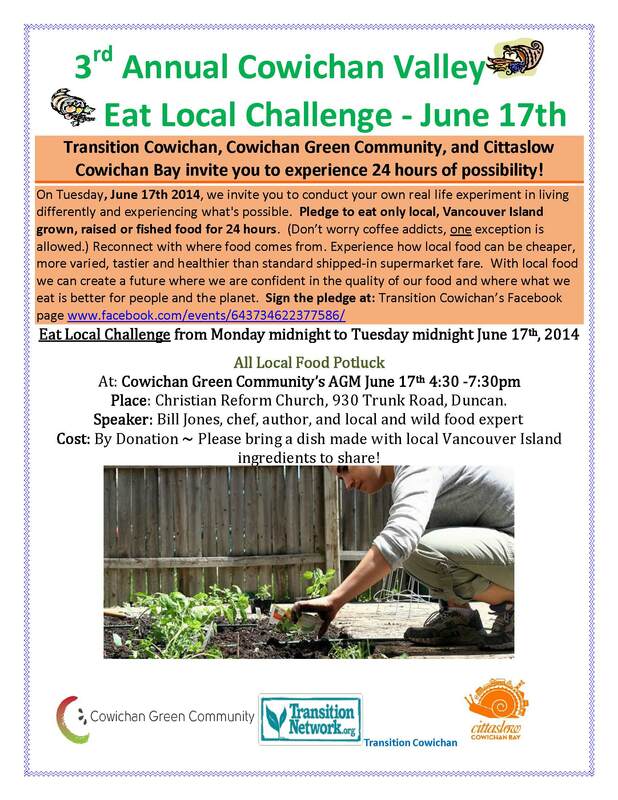 Cowichan residents can sign up for the “Eat Local Challenge” on the Transition Cowichan Facebook page or on paper at the Cowichan Green Community store. 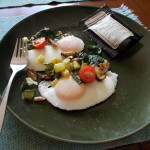 And if you’re already a local foodie, the challenge is to set yourself a stretch goal and see if you can source everything you eat on June 16th from right here in the Cowichan Valley. It is doable! To celebrate the day everyone is invited to bring a local dish to an all-local potluck dinner as a part of Cowichan Green Community’s AGM on the evening of June 16th from 4:30 – 7:30pm at the Christian Reform Church in Duncan. 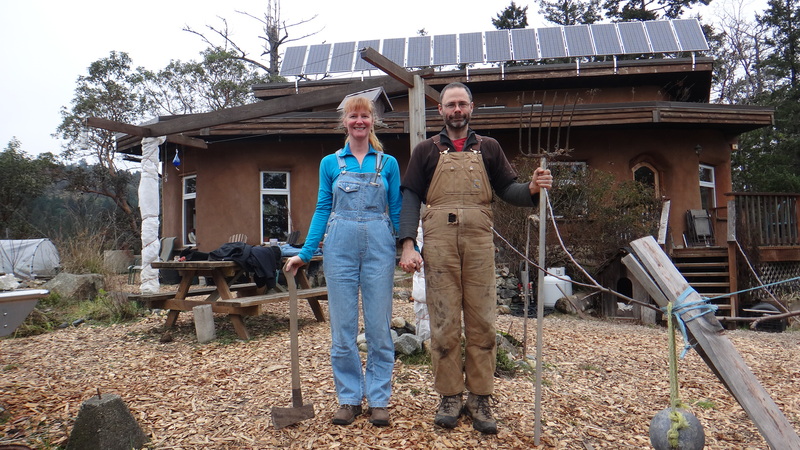 This year’s guest speakers with be Anne and Gord Baird who walk the talk of local growing and eating and overall sustainable living at their home, Eco-Sense – which has been called the “World’s Greenest Modern House”. Admission is by donation. Hope you’ll join us! 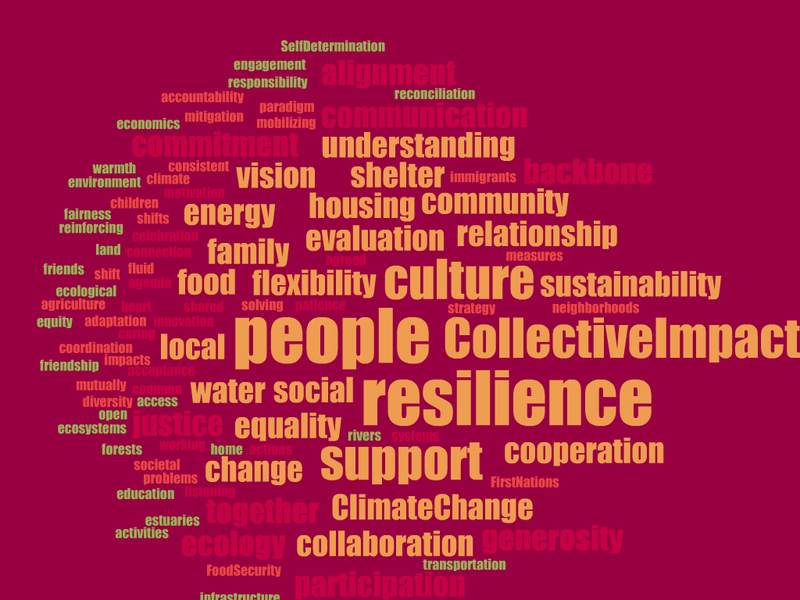 Our community will experience increasing stress from the increasing impacts of climate destabilization. 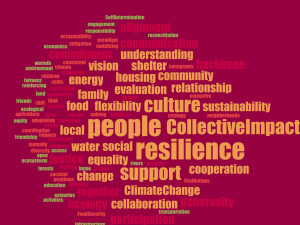 Vulnerable citizens, such as children, poor and frail seniors, the homeless and low income families with fewer resources and less mobility, will be especially challenged to respond and adapt. 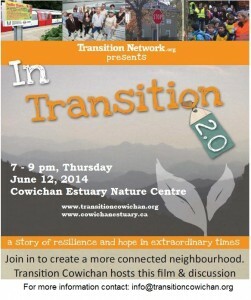 To develop adaptive solutions that meet the needs of everyone in the Cowichan, we need to work together, strengthening our ability to co-operate within & between sectors & among neighbors, collaborating across local governments, First Nations, social benefit and environmental non-profits, business, faith groups & others.” Collective Impact is the approach we are working with in approaching this complex issue. Check out the Collaboration’s Facebook Page. 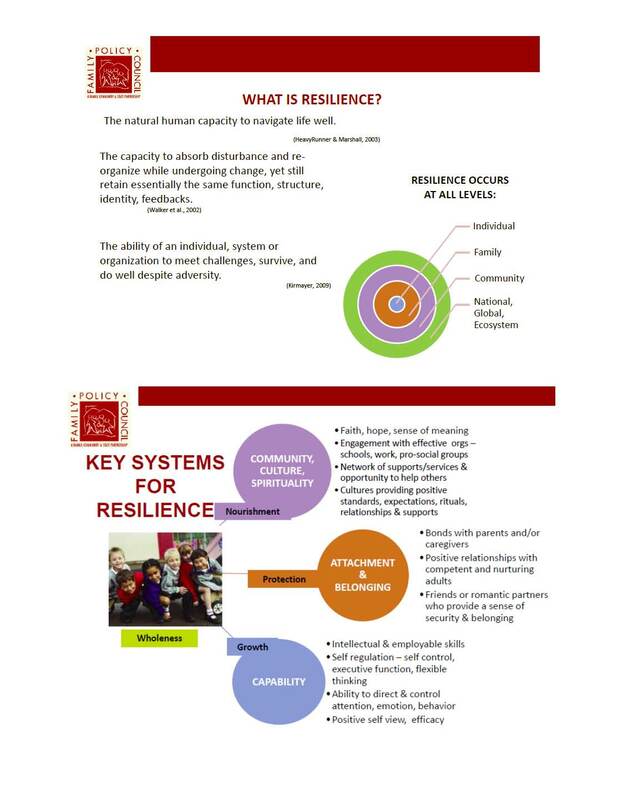 Related to this initiative on Wednesday, May 20, 2015 , there was a public presentation and discussion on Collective Impact – an Approach to Addressing Complex Problems, at Island Savings Centre. And on November 3, 2015 there was a public lecture “A Conversation on Climate Change: The Inconvenient Truths of Our Time & How to Talk About Them” and discussion with the Canadian Centre for Policy Alternatives Climate Justice Director Marc Lee and communications specialist Cara Pike at at VIU Cowichan Campus lecture theatre. 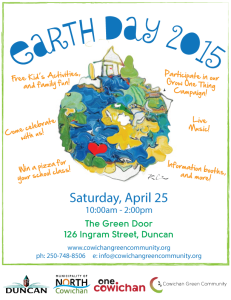 Join us for Earth Day Celebrations tomorrow, Saturday Apr. 25th from 10 am to 2 pm. The festivities are on the grounds of the Green Door adjacent to the Duncan Farmers’ Market. There will be marimba all day on the Duncan stage and lots of local vendors at the market. 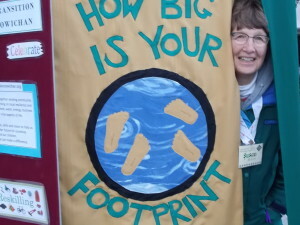 Earth Day participants include: Transition Cowichan, along with Cowichan Green Community (CGC), Cycle Cowichan, the Tiny Homes initiative, U-Cycle, One Cowichan with its Cowichan Solar campaign, the towns of North Cowichan and Duncan, with their Climate Action Plan and Blue Dot initiatives and others. Forty classes of elementary-aged children will have “passports” and receive a “stamp” at each booth after participating in an activity. 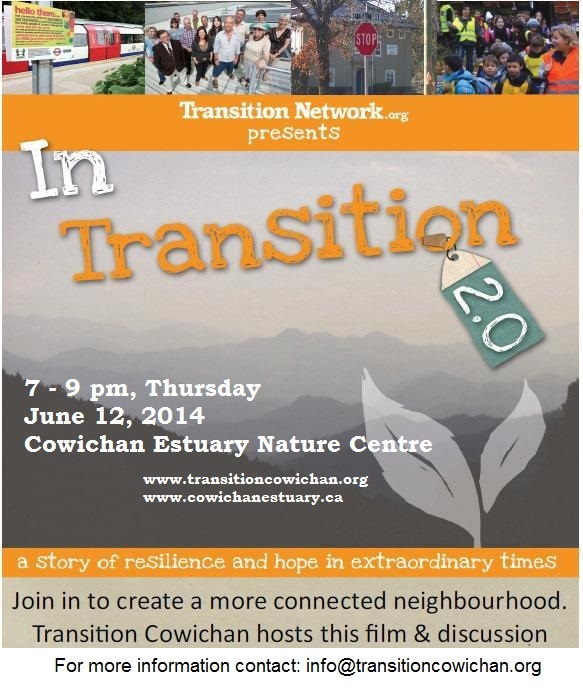 Transition Cowichan’s Susan Smith will have her treadle sewing machine at the ready to teach children and others how to hem napkins – learn a new skill and start to replace the family’s disposable napkins with cloth all at the same time! 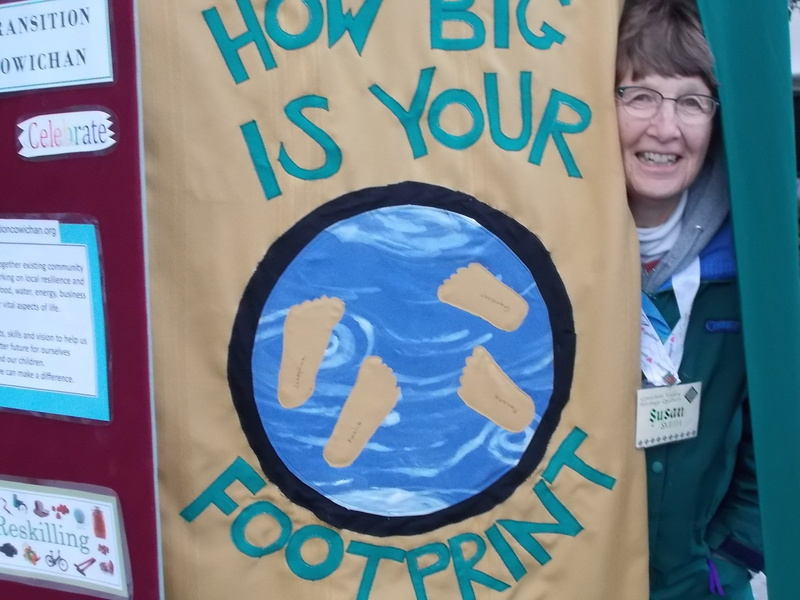 Susan has also quilted us a new banner! For our “Passport” activity – Sandy has plant tags ‘upcycled’ from plastic milk jugs for kids to label. These will then be used at the CGC booth where they will be planting seeds into newspaper pots. 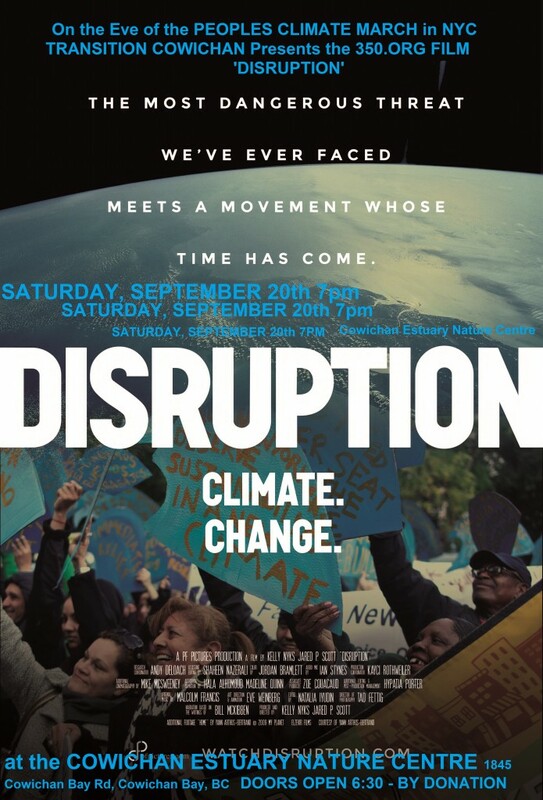 Disruption explores how we got to this social, moral and ecological crossroads. The film also takes us behind-the-scenes of the efforts to organize the largest climate rally in the history of the planet during the UN world climate summit that begins on September 21st. 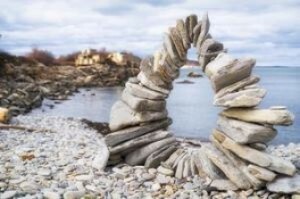 This is the story of our unique moment in history. We are living through an age of tipping points and rapid social and planetary change. We’re the first generation to feel the impacts of climate disruption, and the last generation that can do something about it. 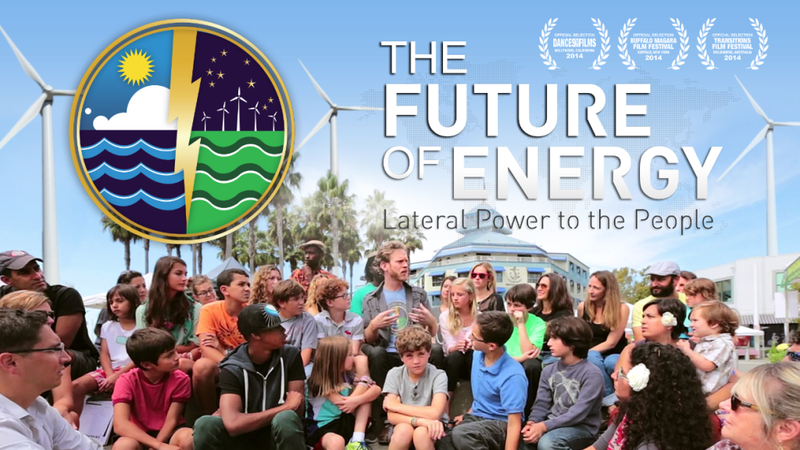 The film enlarges the issue beyond climate impacts and makes a compelling call for bold action that is strong enough to tip the balance to build resilient communities and a clean energy future that does not leave the world’s vulnerable people behind.